Research reveals that almost 50% of all leads never received any follow up. It also shows that companies with a formal process for following up with leads have at least 40% greater profitability. It’s not that small business owners don’t want to respond, it’s simply the reality of running a small business. 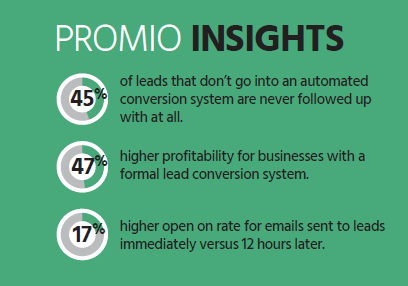 Promio understands that running a small business means you don’t have time to follow-up on all your leads and you really don’t want to spend time and money all the different pieces of software required to create and automated lead follow-up system. That’s why we’ve built our cMax Lead Conversion Engine. cMax automatically follow-up with every lead we generate and even alerts you on your mobile phone when the time is right for you to call the lead and close the deal. That means you not sleep well knowing all of your leads are receiving follow-up, but you can also spend all the extra time and money it generates on other parts of your business – or maybe just on yourself. Automated email and mail drip campaigns for every lead. Email and mobile alerts at the best times for you to call each lead. Lead manager organizes all of your leads in one place. Track every piece of communication sent to every lead. Full automation means you spend less time on marketing and guarantees every lead receives follow-up. Revenue reporting allows you to see exactly how much money you make from your marketing.